Today I have a comparison post for you that borders on AMAZING. 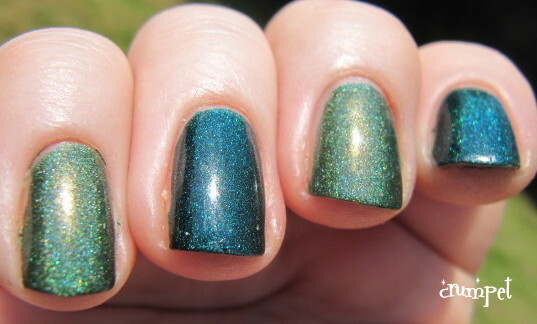 Not 1 or 2 but 3 yes 3 holos, all in greeny teal country. On the left hand we have a-England Saint George and HITS Hera (Hera on the index and ring fingers). 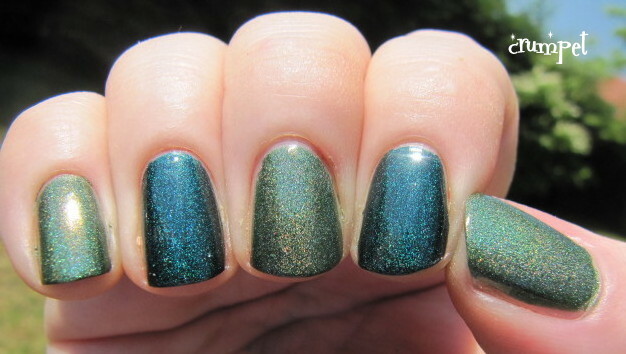 Saint George is a deep dark forest green which sparkles like black emeralds when the sun ingnites it. 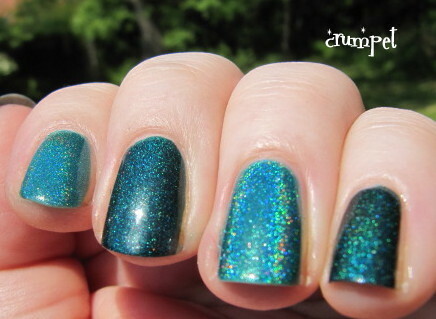 I've heard a lot of people call Saint George teal, but to me it isn't. I can't see an ounce of blue in there - just pure mystical greenery. I should also point out that this is a one coater - it's THAT awesome. It's a scattered holo, but there's never a moment when you can't see some sort of holoey goodness going on. 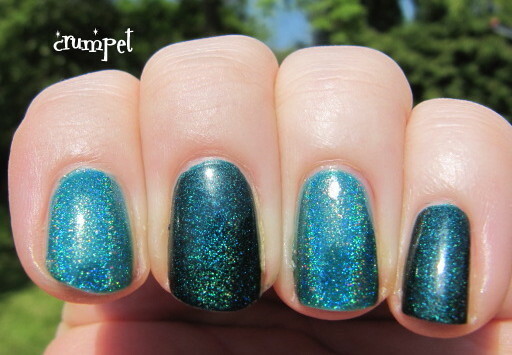 HITS Hera is totally different - now THIS is a teal. This hovers between bluey green and greeny blue, and has the depth of fathomless oceans. 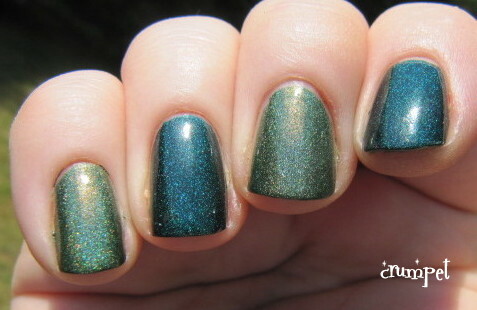 Formula wise it's much thinner - this needed 3 coats - but look how she shimmers and shines! This is soooo oceanic. I hope you can see how much blue there is compared to Saint George. And then on the right hand, we have Saint George again, but this time alternating with a-England Dragon. 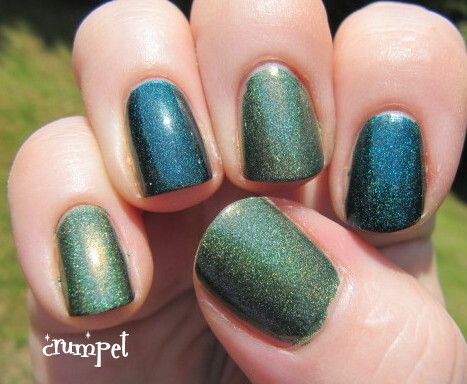 Dragon is a fabulous swamp green holo - there's a lot of yellow in this one, especially compared to George. 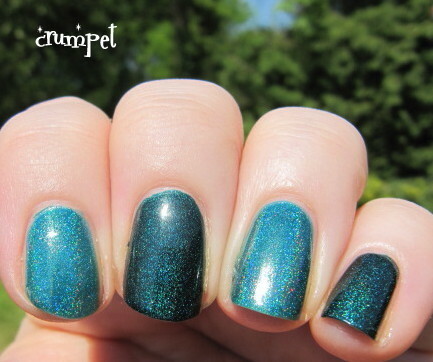 Mostly, Dragon reminds me of fresh cut lawns :) Because it's slightly lighter than George, the holo is more obvious - definitely a stunner.